Very simple, if you have a late E36 (96+) you have a CDN/DRL relay that causes your high beams to come on at reduced power. Most people on the net will tell you that you need to buy a new relay (US one), but there is a far easier way to do it. Just splice one wire and you're done. 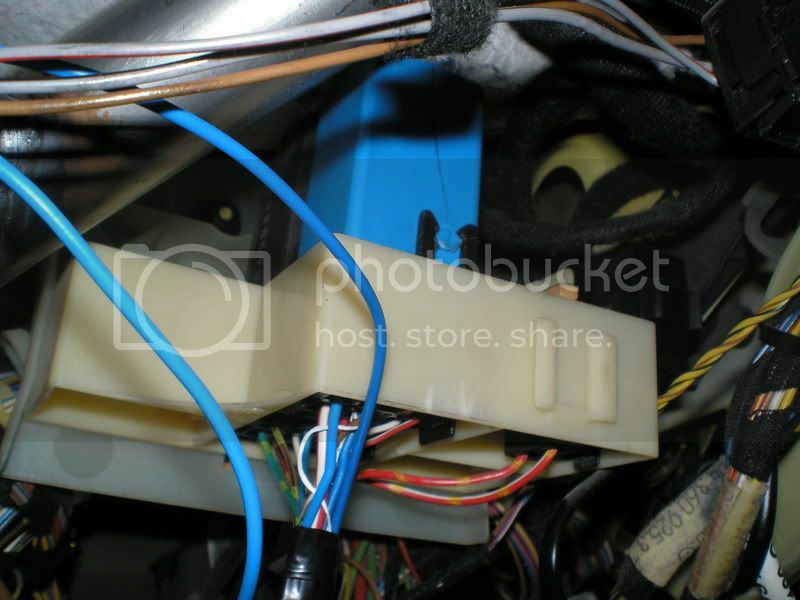 -You will then find on the left most corner closest to you there is a thin yellow wire coming from the bottom of the relay (in the above pic its blue because that is a US car and that pic is come someone adding DRLs to his car). That's what sends the signal to the relay to turn off the DRL's when you turn on the low beams. -Cut that wire and connect it to a switched 12V source towards the relay side of the yellow wire. That's it, no more DRL's, no cost easily reversible if you wanted to. Out of curiosity, why would you want to do this? I actually don't mind the DRLs on 96+ cars. It sucked on early models with full low beams and parking lights always on. im confused. the OP says cars 96+ that have high beams as DRL, and pre 96 has low beams as DRL. my car was built May 1995 and it has high beams as DRL, will this trick work on mine? Because DRL's look stupid and I'm smart enough to turn on my lights when the need arises. the US relay is very cheap, and you can sell the CDN relay for much more. ^^ can i purchase the US drl relay from any canadian bmw dealer or would i have to get it from US? part number? or buy a used module for $25, don't be cheap and don't mess your installation up...??? has nothing to do with being cheap... it's one wire and easily reversible. I don't see the point in going through the hassle of buying/selling relays for this. connect it to a switched 12v source towards the relay? in confussed about this part. connect both ends of the cut wire to where? pics???? No, once you cut the thin yellow wire, connect the side that comes from the relay to a switched 12V source... the other wire can just stay there (just tape it up). I just noticed you have a 1994 E36, this method will not work for you. As I mentioned in my OP, this is for late model (96 and newer) models only. The older models don't use a relay, the DRL's are hardwired in the fusebox and it's a PITA to do (I've done it once). Last edited by NOTORIOUS VR; 12-27-2012 at 11:21 PM. ok then i can connect it to the headlight switch right? I did it (with the relay) because the high beams look yellow next to the angel eyes and HID's. The angel eyes suffice as DRL's and look better...IMO..